After years of customer requests and a new kettle, US Wellness Meats is proud to offer Pork Lard! Pork Lard can be used for frying or cooking. It is also the perfect “secret ingredient” for phenomenal baking. If you give Pork Lard a try, it may soon become your favorite kitchen fat. US Wellness Meats’ Pork Lard is not bleached, deodorized, hydrogenated, or altered. 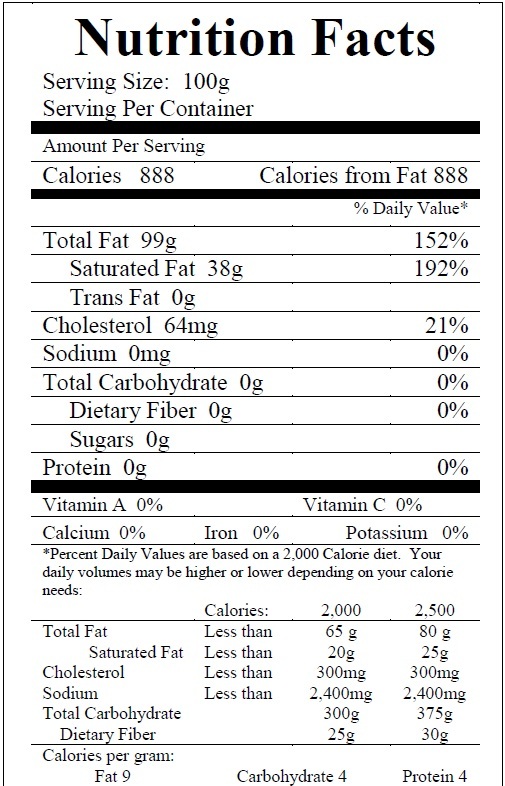 Although it is labeled as 'refined' per USDA requirements, it is simply rendered pork fat. Nothing has been done to or added to Pork Lard. Each Pork Lard pail weighs approximately 2 pounds. Pork Lard is not highly perishable. Pork Lard will keep for years in a freezer and months in a refrigerator. Pork Lard can be unrefrigerated for a month without any issues. However, at some point, the surface will begin to oxidize. I recently fell in love with lard. Fried eggs in lard are amazing. This lard is high quality and goes a loooong way. Nobody knows where the store stuff comes from. Knowing this comes from good sources wasa no brainer to try. So glad I did. This lard is high quality, clean and tasty. You get what you pay for. I use this stuff to cook most all foods, whether I'm sauteing onions or pan-searing chicken thighs. Best lard I've found. Some lards have a very distinct (dare I say off putting) taste of pork, this does not. I've used it to fry eggs, saute veggies as well as roasting meats/veg and nothing tasted of pork. Great quality; long lasting and quite tasty. Hope you guys will offer pork leaf lard in the future. I need it for my pastry!